WESH's Dan Billow reports on NASA's spaceship selections. NASA is awarding $269.3 million to four companies that plan to work on new spaceships capable of ferrying astronauts into orbit. The money is going to Blue Origin, the Boeing Co., Sierra Nevada Corp. and SpaceX. The awards, ranging from $22 million to $92.3 million, are aimed at supporting the development of private-sector space transportation systems that will help fill the gap left by this year's expected retirement of the space shuttle fleet. This is the second phase of the Commercial Crew Development program, also known as CCDev2. Last year, $50 million was awarded for the first phase of the program, and NASA is asking for another $850 million to cover a third phase. Philip McAlister, acting director of NASA Headquarters' Commercial Spaceflight Development program, told journalists today during a teleconference that the $269.3 million in CCDev2 funding would be doled out as companies achieved milestones laid out between now and May 2012. It will take more time and money, however, to get the private-sector spaceships into service. "We are targeting the middle part of this decade to hopefully have services available for purchase," McAlister said. 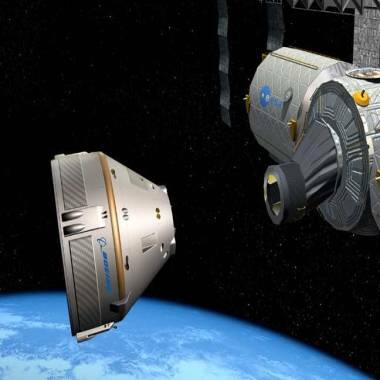 An artist's conception shows Boeing's CST-100 capsule, which is getting development funding from NASA. 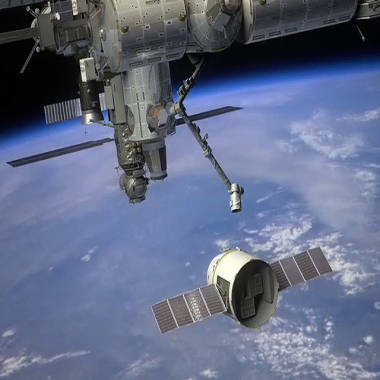 • The Boeing Co. is getting $92.3 million for its CST-100 project, which would create a seven-passenger space capsule for travel to and from the International Space Station — or other orbital destinations such as Bigelow Aerospace's inflatable space stations. The CST-100 effort already received $18 million during the first CCDev phase. Sierra Nevada's Dream Chaser craft approaches a space station port in this artist's concept. • Sierra Nevada Corp. was allocated $80 million for its Dream Chaser space plane, a seven-passenger craft designed to be launched vertically on a rocket and land horizontally like an airplane. NASA paid Sierra Nevada $20 million for Dream Chaser development during CCDev1. Among Sierra Nevada's many partners in the project is Virgin Galactic, which is involved in suborbital space tourism and could eventually extend that business to low Earth orbit. An artist's view shows the SpaceX Dragon coming in for a docking with the International Space Station. • SpaceX was selected to receive $75 million, to work on what the company said were "the final upgrades needed for the Falcon 9 rocket and Dragon spacecraft to carry astronauts." NASA said those upgrades would include development of a side-mounted launch abort system and the hardware for accommodating crew in the Dragon capsule. SpaceX is already receiving millions of dollars from NASA to build out the Dragon as an unmanned cargo-carrying spaceship. In December, the company conducted a fully successful test launch of the Falcon 9, putting a Dragon into orbit and bringing it back down for a Pacific splashdown. The California-based company did not receive any money from the CCDev1 program. Blue Origin says it intends to build the orbital space capsule shown in this artist's conception. • Blue Origin, the somewhat secretive space venture backed by Amazon.com billionaire Jeff Bezos, has been alloted $22 million to continue work on its crew spacecraft and its "pusher" launch abort system. The company received $3.7 million from NASA during CCDev1. "This was a very competitive selection," McAlister said. One of the companies losing out was United Launch Alliance, which wants to offer the Atlas 5 and Delta 4 rockets as launch vehicles for trips to the space station (and was awarded $6.7 million during CCDev1). Another loser was ATK, which supplies the solid-fuel rocket boosters for the space shuttle — and proposed building a Liberty launch vehicle using elements of those boosters as well as an upper-stage core from Europe's Ariane 5 rocket. NASA also passed up a proposal from United Space Alliance, the prime contractor for the space shuttle program, to keep two of the shuttles running as a commercial operation. Today, McAlister declined to specify exactly why the four winning proposals were chosen over the others. "It was never one thing," he said. He said NASA officials considered how far along each company had come in its development program, how the federal money would accelerate development, how much internal funding each company was committing to its project, and how viable each company's business plan was. He promised that NASA would release further details about the selection process once the winners and the losers had been briefed and given an opportunity to provide feedback. Independent space consultant Charles Lurio told me that launch vehicle providers such as United Launch Alliance shouldn't lose heart just yet. "I think ULA wins in any case," he said. "Three out of four [Boeing, Sierra Nevada and Blue Origin] are looking for boosters, so ULA will definitely keep their work warm." Ed Mango, program manager for the Commercial Crew Program at NASA's Kennedy Space Center, told reporters that the work covered under the CCDev2 agreements would begin as soon as possible. "We're at the starting gate, ready to go," he said. NASA officials emphasized that the slate would be wiped clean for future rounds of funding: Winning this time around would not guarantee additional support later, and today's losers could be the winners next time. NASA won't be left totally in the lurch when the shuttles retire: It has already worked out more than a billion dollars' worth of agreements to transport U.S. astronauts to the space station on Russian Soyuz craft. Unmanned European, Russian and Japanese transports are capable of sending cargo to the station, and commercial U.S. spaceships such as SpaceX's Dragon could start ferrying cargo in the next year or two. For the longer haul, NASA is just starting to look into the development of a heavy-lift rocket and multipurpose crew vehicle capable of going beyond Earth orbit. But those next, next-gen vehicles aren't expected to enter service until 2016 or later, and they're likely to be significantly more expensive than the "space taxis" that are being supported through the CCDev program. NASA Administrator Charles Bolden recently said that commercial spaceships would play an essential role in the agency's long-range plans — and he reiterated that view in a statement released today. "We're committed to safely transporting U.S. astronauts on American-made spacecraft and ending the outsourcing of this work to foreign governments," Bolden said. "These agreements are significant milestones in NASA's plans to take advantage of American ingenuity to get to low-Earth orbit, so we can concentrate our resources on deep space exploration." In today's news release, Mango said that "the next American-flagged vehicle to carry our astronauts into space is going to be a U.S. commercial provider." "The partnerships NASA is forming with industry will support the development of multiple American systems capable of providing future access to low-Earth orbit," he said. Do you agree or disagree with NASA's push for commercialization? Do you think the traditional way of doing things, with NASA astronauts flying on spacecraft built and maintained exclusively for NASA, is still the way to go? ... Or is "the traditional way of doing things" even sustainable anymore? Whatever your view, feel free to weigh in with your comments below. To learn more about the spaceship projects, check out NASA's Exploration Systems Mission Directorate webpage and Kennedy Space Center's procurement portal on the Web.